Simulating the natural colour spectrum of sunlight, the Tru-lux light system will help you put on your ideal makeup. 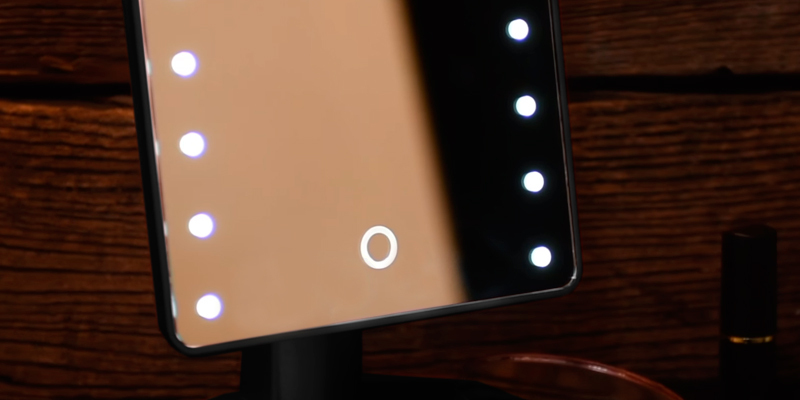 The built-in battery of this lighted mirror is USB rechargeable. 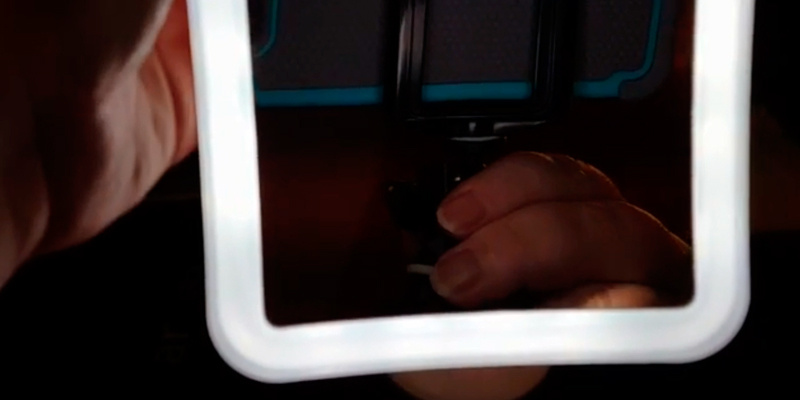 The lighting will turn off automatically if you are too far from the mirror. 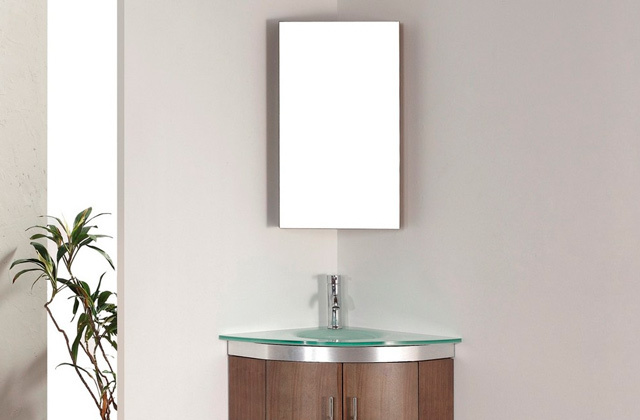 This mirror has a stylish design and emits a mild natural lighting. The reflection is distortion-free at any viewing angle. You can select the mirror of the appropriate diameter (12, 16.5, 20 cm) and magnification rate (5x, 7x, 10x). 360° rotatable, this ergonomic lighted mirror can be easily adjusted to any desired position for the user's maximum comfort. 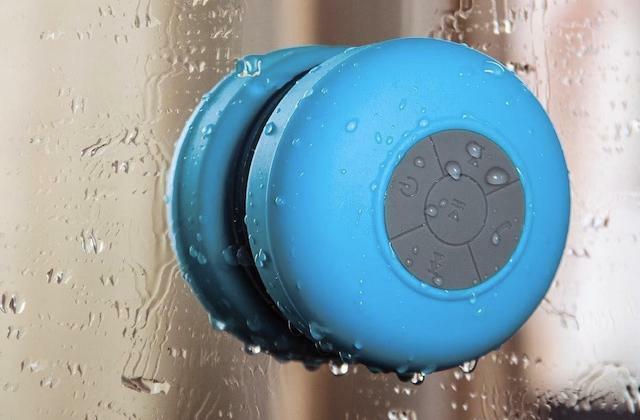 Its reliable suction cup leaves no residue or marks on surfaces. As the switch sticks out, it might accidentally turn on in your bag. Boasting a 10x magnification and providing bright natural lighting, the Fancii FC-LMMM10XS is an excellent helper for both professional makeup artists and anyone who wants to look great. Your makeup will be perfect to the tiniest detail. 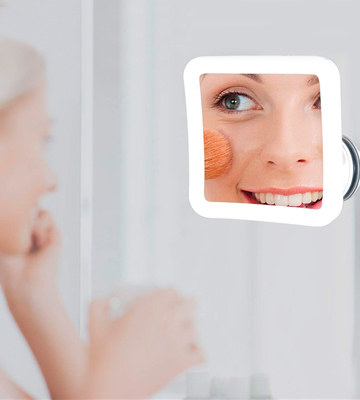 Equipped with 20 bright LEDs (4000-5000K colour temperature), this makeup mirror allows you to clearly see every spot on your face even at night. You can adjust the LED brightness to your own preferences. Vanity mirror's suction cups might leave marks on the surface of the main unit. 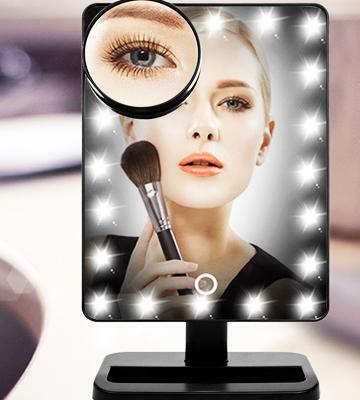 This fantastic LED lighted mirror with adjustable brightness is a wonderful choice for applying professional makeup as well as for daily skin care. 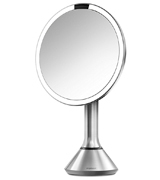 An additional magnifying mirror (8.8 cm in diameter) will be useful if you need to remove unwanted hairs. 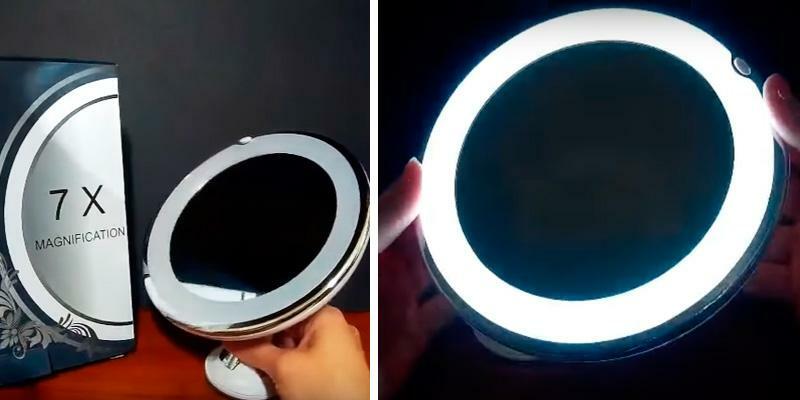 As compact as it is (14 cm in diameter), this lighted makeup mirror will take little space in your bag, so it's a great travelling vanity mirror. You can attach the accessory to any non-porous surface. A battery life might be somewhat short. 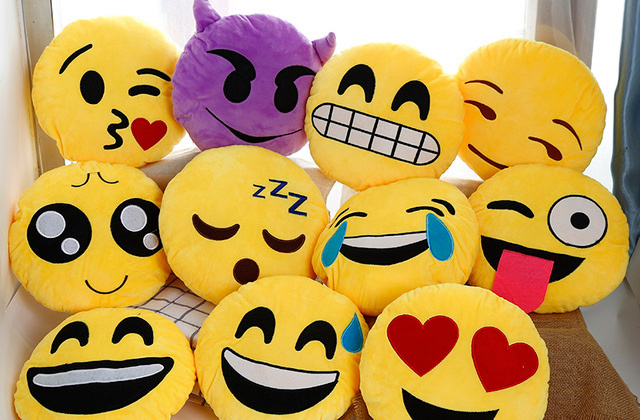 A wonderful choice for everyday use! Simulating daylight, the LED lights of this mirror ensure an even illumination for applying cosmetics. Thanks to the 7x magnification rate, people with poor eyesight can use this mirror without wearing glasses or contact lenses. Thanks to a handy storage tray built into the Zacro makeup mirror stand, you will have the necessary accessories always at hand. The mirror provides no magnification. This stylish rectangular makeup mirror with 16 LEDs provides enough light so that you apply your day or evening makeup. Easy adjustment thanks to a comfortable sensor switch. A minimalistic and stylish design and the highest quality make this light up mirror a wonderful choice for applying your makeup. The Tru-lux light system with an intensity of 600-lux and a colour rendering index (CRI) of 90 simulates the natural lighting, so you can see exactly how you'll look like with makeup on in broad daylight. The 5x magnification will come in handy for when you need to pluck eyebrows, apply eyeliner, use mascara, etc. For enhanced convenience of use, the mirror has an ergonomic built-in sensor that allows activation of the lighting when you approach it - you won't even need to push any buttons. Equipped with a built-in lithium-ion battery, this USB rechargeable mirror can operate for five weeks on one charge; both USB cord and adapter are included in the purchase. 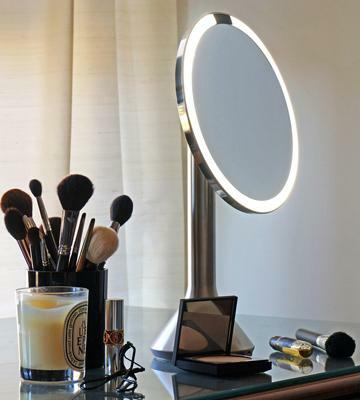 To ensure the most comfortable use, this cordless lighted makeup mirror can be adjusted in various positions so you will get a clear distortion-free view for a flawless makeup. Considering all the above features, along with the 5-year manufacturer's warranty, we can safely recommend it to anyone who loves beautiful but solid things, who isn't ready to compromise quality, and values the comfort above all. Portable and powerful, the Fancii FC-LMMM10XS magnifying mirror was specially designed for precise makeup application. As compact as it is, the item is equipped with 16 daylight bright LEDs and offers 10x magnification which makes it perfect for shaping your brows, lining your eyes, and other tiny tasks requiring accuracy and precision. 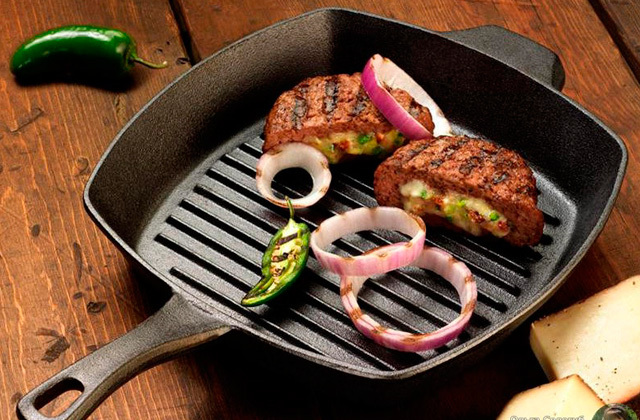 The item is equipped with a reliable suction cup so you can attach it to a clean non-porous surface at your eye level. Easily detachable (simply twist the suction mechanism to lock or to unlock it), the suction cup leaves no residue or marks when removed. 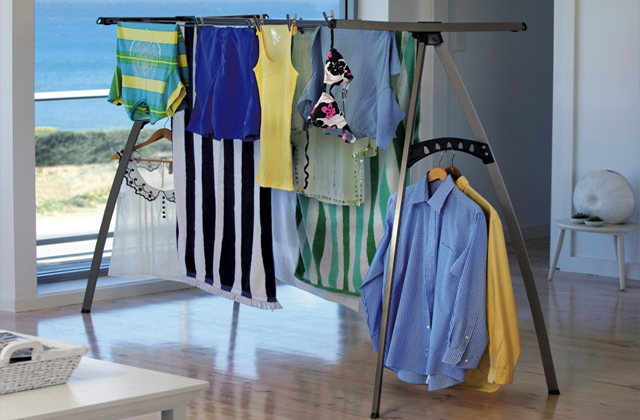 Moreover, the mirror is 360° rotatable, so it can be adjusted to the desired position in a breeze. Battery operated (no cords are needed), the accessory will take minimum space in your luggage when folded, which makes it an excellent choice for travelers. Besides, it comes with an ergonomic travel pouch. Please note that the batteries are not included in the box, so you will need to buy them separately. This product works great for all uses in all situations. Having said that, if you often go on business trips, or just need a smaller lighted magnifying mirror to use at home, this compact model is a great option. 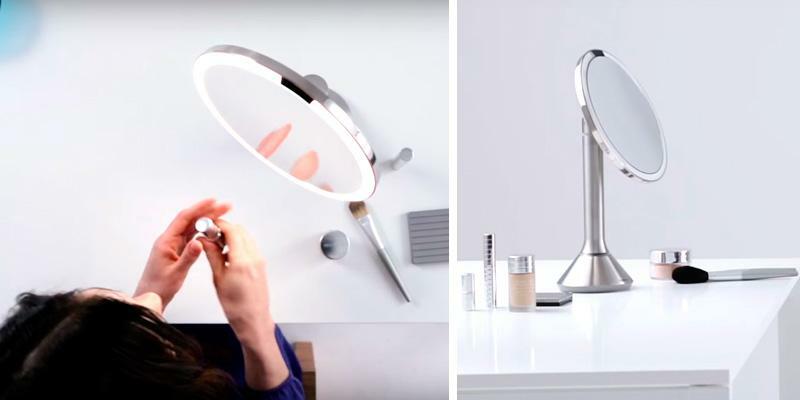 Imagine a makeup mirror with a lighting just as bright as you need at this very moment, a surface large enough to apply cosmetics and do your hair, and a handy magnification spot mirror for seeing the tiniest details on your face. Have a look at the WanEway 12" makeup mirror that's been created to meet the needs of the most demanding customers. 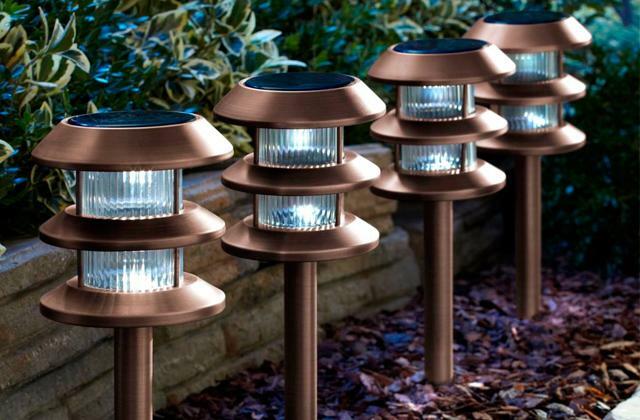 Equipped with 20 bright LED lights, it provides excellent lighting even in the dark. 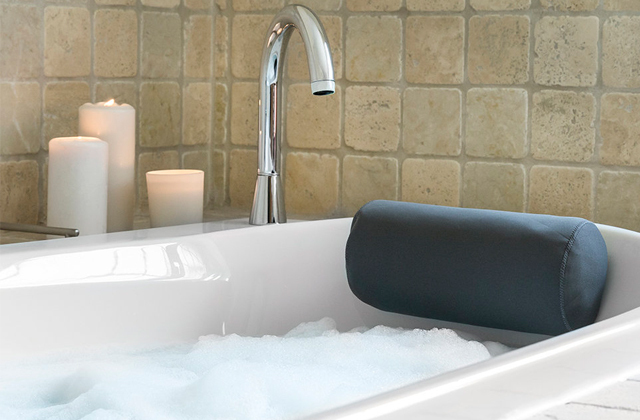 Moreover, its brightness is easy-to-adjust with an ergonomic sensor switch. The colour temperature of 4000-5000K allows setting the desired illumination level to let you see how your makeup will look at any particular time of a day - in the morning, in the afternoon, at dusk, etc. The memory function keeps the last used setting for the next use. This mirror also boasts a competitive 10x magnification ratio. For users' convenience, the manufacturer provided several ways of setting up this mirror, allowing you to hold it in hands while applying your makeup, put it on a table or attach it to a bigger mirror with a suction cup at the rear. 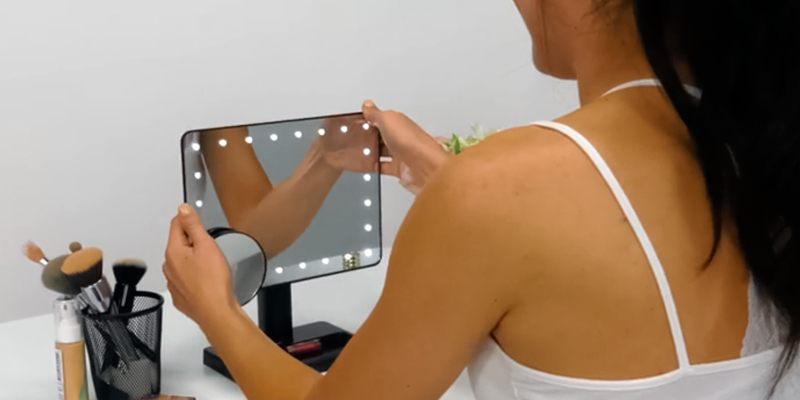 Summing up, whether you are straightening your hair, applying mascara, or shading your lips, the WanEway makeup mirror will come in very handy. The RUIMIO lighted makeup mirror is probably one of the best mirrors to take you with you on travel trips due to its compact dimensions (14 cm in diameter) and easy-to-fold design. It’ll also work for those girls who need a small mirror to keep in a bag and have within their reach while being away from home. What we personally like about this mirror is that in spite of its small size it still reflects the entire face, all features being clearly seen on its smooth round surface. For particular care and for the situations when you need to have a closer look at some area of your face, the mirror allows 7x magnification which also comes in useful for people with poor eyesight. 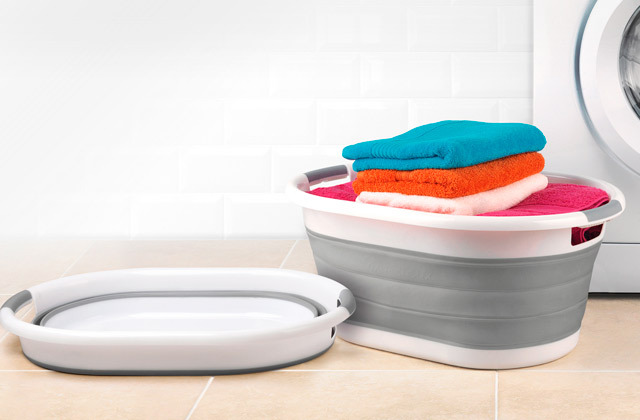 One more welcome feature is the unit's versatility. You can either place the mirror on a dressing table or, using a suction cup on its base, attach it to any non-porous surface, be it a larger mirror or a tiled bathroom wall. Concluding, we’d definitely recommend the RUIMIO LED lighted mirror as an accessory to all girls who seek a stylish and portable mirror to use on the go. 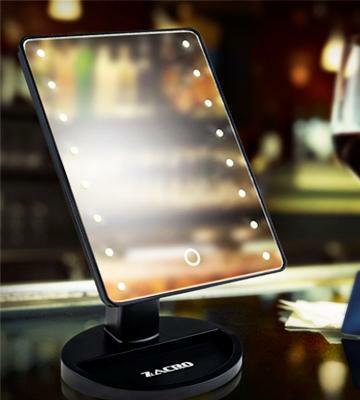 If you are looking for a functional and stylish makeup mirror, consider buying the Zacro illuminated mirror. This model is quite big in size; it has an ergonomic rectangular shape and is equipped with 16 LED lights. The LED lights on the left and right sides of the mirror provide soft, diffused lighting and can be adjusted according to the time of the day, so you can see your face well and apply perfect makeup without missing a spot. This cordless lighted mirror comes equipped with 4 x AA batteries, so you can start using it right out of the box. Moreover, this model has a micro USB port and can be powered from your computer or a power bank if needed. Finally, the accessory has a handy compartment on its base for storing your jewellery and cosmetics. It is pretty lightweight too, so you can easily use it on the go and take with you on your trips. 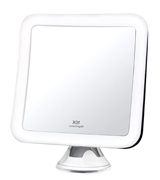 The Zacro ZLM1 cosmetic mirror is not only functional but also very beautifully made. It is slim and comes with a stand making it look very modern and sophisticated. So if you're looking for a lighted mirror that could also serve as a decoration element in your room interior, the Zacro ZLM1 will suit you to a tee. Putting on cosmetics might seem an easy task. However, when it comes to beauty, every detail matters. And the most important thing for trouble-free and accurate makeup application is proper lighting and a handy magnifying mirror. Lighted makeup mirrors were specially designed to make daily self-grooming as well as applying "special occasion" makeup as easy and comfortable as possible. Even a full-length looking glass can't replace a magnification mirror with light. 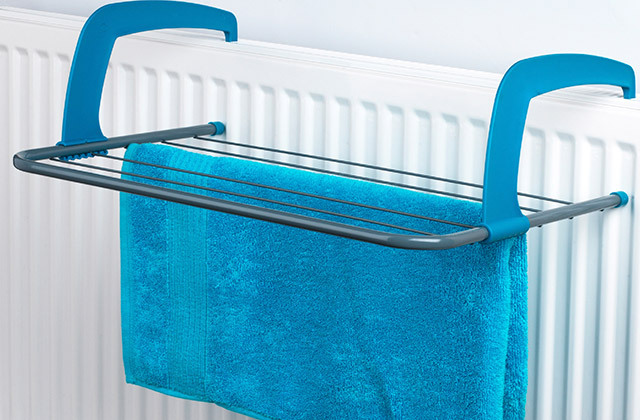 Incredibly convenient in use, the accessory is energy efficient as it uses bright and economical LED lights. 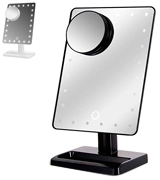 Depending on a model, a lighted makeup mirror can be put on a desktop, mounted on a wall, or attached to a larger looking-glass. Is there a way to enhance your appearance without going to a beauty parlour? To make your skin look healthy, smooth, and glowing, we recommend using one of these face brushes. And if you are looking for a handy and efficient manicure device, you might find one in our nail drills review. Before buying a lighted makeup mirror, you should think where you are going to use it. For example, if you prefer primping in your bathroom, a wall-mounted vanity mirror is a must. 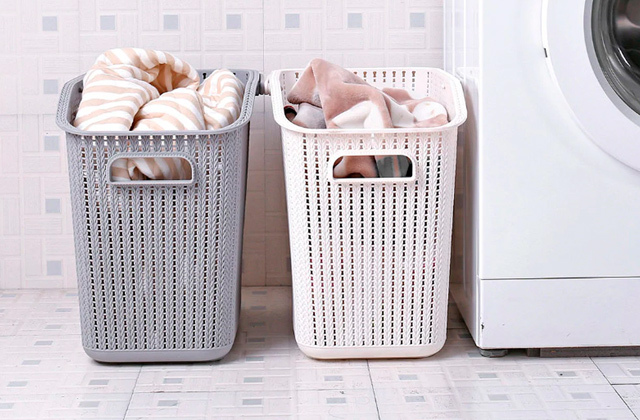 It is a truly space-saving accessory that is always at hand. Taking no space on your dressing table, it is a good choice for your bedroom as well. A wall-mounted makeup mirror allows doing your hair and applying cosmetics like a pro! Yet, if you prefer a portable accessory that can be used at any comfortable place, choose a desktop model. Being pretty compact, a portable vanity mirror is a functional beauty accessory, highly appreciated by customers worldwide. 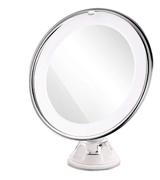 Any makeup mirror has several features that set it apart from a conventional looking glass. 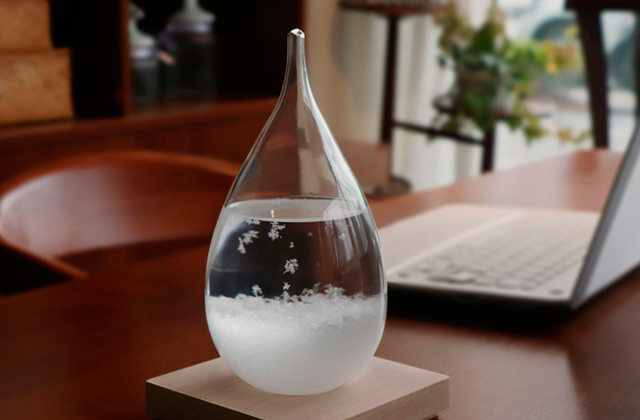 First of all, it is usually double-sided for normal reflection on one side and a magnified on the other. Magnification allows performing high-precision tasks, like plucking your eyebrows and drawing accurate lines. 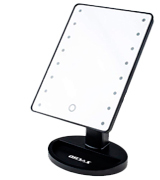 Most makeup mirrors boast a 360° swivel rotation so that you can tilt it at any desired angle. Some models have ergonomic extras like several lighting modes, touch controls, and even a smaller portable magnifying mirror with suction cups on its back. The other thing you may want to pay attention to while choosing a makeup mirror is its power source. Battery-powered lighted mirrors are extremely comfortable and can be used literally anywhere you feel the need to. Mains-powered mirrors can be used when plugged into a power socket only. Some models can use are equipped with rechargeable batteries and can even be powered via a USB port. 1. Jody Morse How to Choose a Magnified Makeup Mirror, Leaf. 2. Choosing a Makeup Mirror, PlumbingSupply. 3. Amy Hoover Makeup Mirrors, LoveToKnow. 4. Tips For Choosing A Fantastic Make-up Mirror, Editorial Today. 5. How to Apply Lipstick, wikiHow. 6. How to Do Natural Makeup, Real Simple. 7. How to Remove Makeup, wikiHow. 8. Sonia Haria How to get the perfect eyebrow shape for your face, Telegraph. January 26, 2016. 9. Grace Gold The Best Lighting for Applying Makeup, YouBeauty. August 15, 2014.